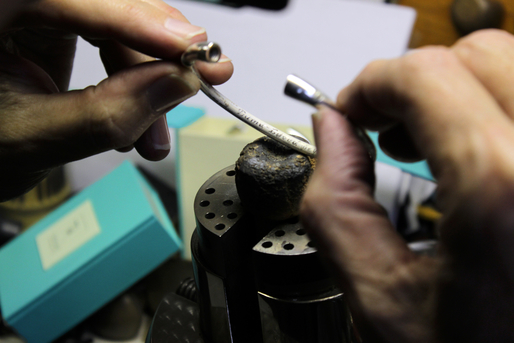 The start of the Traditional Hand Engraving process at Richard Hughes’ Studio. Photo by Jamiece Adams. At Treasured Memories® fine keepsake jewelry, we constantly strive to find new ways of creating the most innovative design, style, and detail for our custom Cremation Jewelry and Keepsake Jewelry collections. So in 2008 when we sought out a hand engraving specialist, it is no surprise we found ourselves at the office of Richard Hughes Engraving in our hometown, Chicago, Illinois. 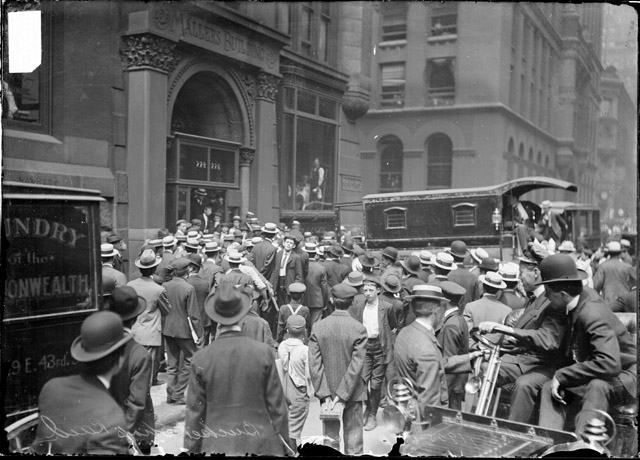 Jewelers Center tells the story of the birth and expansion of the Chicago Jewelry Trade (jewelerscenter.com). According to the Encyclopedia of Chicago: Upon opening its doors, “the [Mallers] building at 5 S. Wabash began to house jewelry manufacturers, jewelry wholesalers, and jewelry retailers” (encyclopedia of Chicago). By World War II it was home to the most historically influential and “important Chicago [Jewelry] Firms” like Sherman Tucker and M.Y. Finkelman (encyclopedia of Chicago). International acclaim was brought to the entire city of Chicago when Finkelman’s son, Marshall, opened trade with international gem markets and birthed the Jewelers Mall in the late 1980’s. Today, the Mallers Building Jewelers Mall is an 21-story home to just over 180 select fine jewelers. That number includes our own, Richard Hughes Engraving. So what sets Richard Hughes apart from the other engravers who have made their homes in one of Chicago’s best Chicago jeweler communities? We took a trip through the loop, to the heart of Chicago’s Jewelers Row to find out for ourselves. 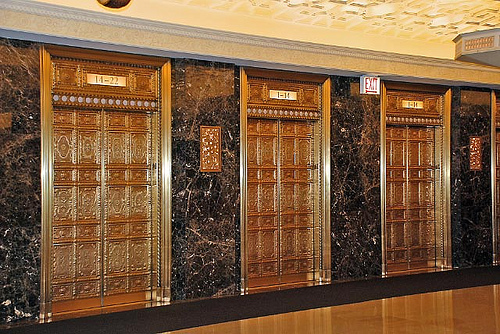 Richard’s studio lives just beyond a row of stunning art deco, graphic golden colored brass elevators and beyond two sets of secure buzzer-locked doors. He’s spent 40 years in the building where he uses tools used to those similar to those used in a 500 year old technique for engraving. Hughes expanded on the secret of his historic technique saying, “One letter takes about several movements of the bracelet’s position and careful hand work here is key; there are only about four engravers left in the city who work by hand that I know of. . . So it truly is a one in a million job”. Our Directing Manager, Mr. John Pink would argue that it is a “one in a billion” job, and that “Richard Hughes is one of the best engravers of Chicago”! 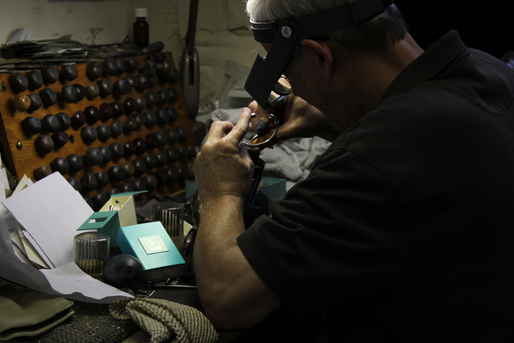 Richard Hughes lends his unique eye to add to the engraving tradition. Photo by Jamiece Adams. Richard Hughes adding a skillful, personal, touch to a Treasured Memories Keepsake. Photo by Jamiece Adams. 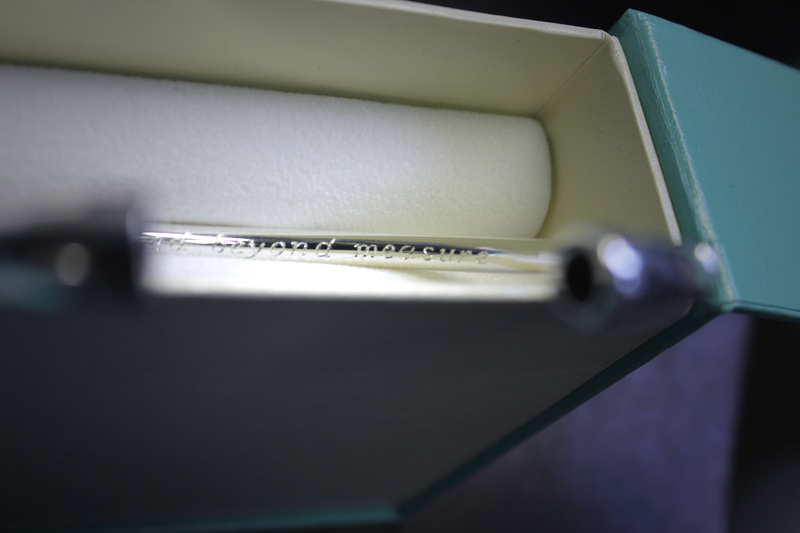 When all is said and done, he’s not just about engraving for Treasured Memories® (unfortunately, for us!). Over the years he has done engraving for Georg Jensen, Tiffany & Co., as well as many others and has engraved the Trophy for the Indy 500’s Silver, priceless, trophy for over 30 years. Custom Jewelry with quality beyond measure. Photo by Jamiece Adams. Treasured Memories® means that each Cremation Bracelet, Keepsake Pendant, and Memorial Gift is personalized beyond measure. 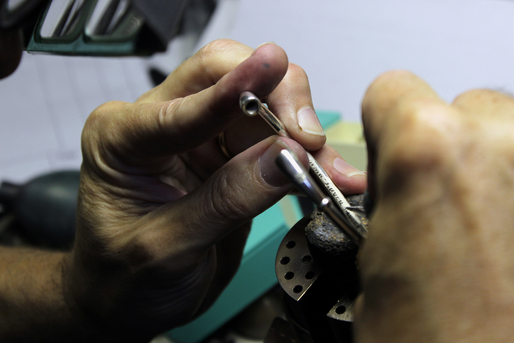 With the time it takes to craft each piece by hand, Hughes gives us a “one in a million”, invaluable timeless piece of Jewelry That Keeps A Secret® forever. Which of our personalized memorial gifts would you choose? With Richard Hughes in our corner, we hope to have the chance to make your personalized, one of a kind keepsake memorial jewelry piece- and the opportunity to serve you well. “The Jewelers Center Is Home to More than 180 Fine Jewelers.” About Us: A Chicago Tradition Since 1921. N.p., n.d. Web. 12 Sept. 2016. Rubin, Eli. “Jewelers’ Row.” Encyclopedia of Chicago. Chicago Historical Society, 2014. Web. 12 Sept. 2016. *All images are taken by Jamiece Adams. TMK reserves full rights and ownership of the images included.